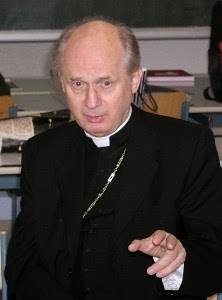 (Vienna / Rome) Bishop Egon Kapellari of Graz-Seckau had announced his retirement four days ago. He had just completed his 79th year of life and is expecting release from his position as supreme pastor of a diocese. Today Pope Francis accepted the resignation of the long-serving and retired the Bishop of Austria. Egon Kapellari was born on 12 January 1936 at Leoben in Upper Styria. In 1957 he received his doctorate of law at the University of Graz. Then he began at the University of Salzburg with the study of theology. 1964-1981 he was also university chaplain in Graz. In1981 Pope John Paul II. appointed him Bishop of Gurk. The mid-80s Kapellari was consideredin the progressive climate distant from Rome, the most "Romtreuest" [Most loyal to Rome] among Austrian bishops. When John Paul II. sought to achieve a new direction in the episcopal appointments in the Austrian Church with the retirement of Cardinal Franz König from 1986, it was a quiet time for Bishop Kapellari. In 2001 he was appointed by John Paul II. from Carinthia back to Styria and appointed Bishop of Graz-Seckau. 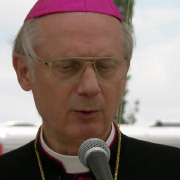 At the same time Kapellari was Vice President of the Austrian Bishops' Conference. He is responsible for the areas of liturgy, culture and media. 2011 Kapillari heard a bizarre proposal: priests who do not adhere to celibacy, a fine should be imposed. Toward the "priest" initiative, disobedient priests, Kapellari showed himself to be as indecisive as his brother bishops. In March 2013, Kapellari spoke to Pastor Karl Tropper of St. Veit am Vogau of a ban on preaching, because he had expressed criticism of Islam and homosexuality. Pastor Tropper was come to the attention of the media and was dropped by the bishop and sent to early retirement. October 2013 Bishop Kapellari had just been appointed the tradition-priest Konrad Sterninnger of parish ministry. Even before the well-known priest entered his new responsibility for three parishes, progressive circles organized a smear campaign against Father Sterninger. The Parish Councils informed the bishop to reject the priest. The Diocese talked about finding a task that "better" corresponded to "his talents." Since the beginning of 2014 he is the same again provisor the Pilgrimage Church of Frauenberg-Rehkogel in Upper Styria. In September 2014 Bishop Kapellari forbade a "service for remarried divorcees, gays, lesbians and single mothers" with "Communion for all". The service was organized by a priest, Bernhard Preiss, a disobedient priest of the "priest" initiative and the suspended Deacon Gottfried Url. Kapellari spoke of a rash "go it alone". Both in the cause of Cardinal Gröer (Archdiocese of Vienna) as well as in that of almost Bishop Wagner (Diocese of Linz) showed Kapellari a flexible attitude. From progressive he was decried as "conservative", however the conservative was limited, less on the public defense of Catholic doctrine, but rather to sitting out progressive demands. To them he replicated especially with the neutral warning of a "division" of the Church, without too much content in responding to the questions. In progressive criticism, Kapellari was a "brakeman before the Lord" (The Lady), therefore, is not entirely wrong. The profile of a strong preacher of the faith and a spiritual leader who must take responsibility for his diocese, looks different. However, Kapellari never saw himself in a leadership position. "I'm not a tribune of the people," said the quiet, rather shy, episcopal priest in the early years. Nevertheless, he just stood at the head of a diocese for nearly 34 years. Maybe they in Rome and Vienna are convinced that this is the maximum possible in a time critical of the church. The Chapter chose the former Vicar General Heinrich Schnuderl as Administrator. 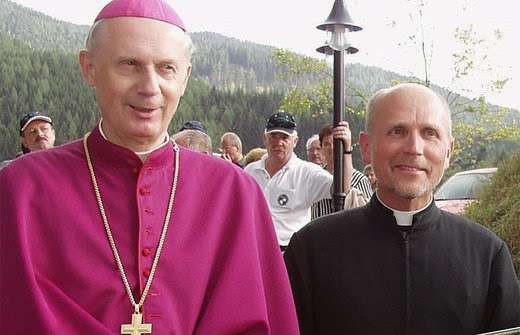 It is expected that Kapellari's successor will not come as diocesan bishop of Styria. 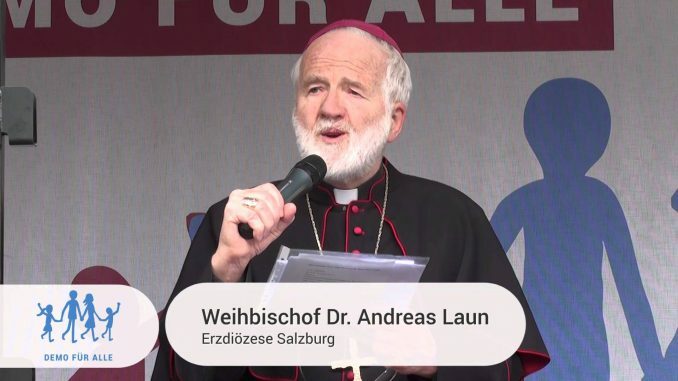 Bishop Bars "Mass for Remarried and Homosexuals"
Graz-Seckauer diocesan priests have provoked with controversial Masses. Bishop Kapellari puts on the emergency brake. Priest: "We will not completely ignore the ban of the bishop, but also not entirely obey." Graz (kath.net) The Graz diocesan Bishop, Egon Kapellari, has banned a controversial "Mass for remarried and homosexuals" in the parish of St. Margaret, as reported by the "Kleine Zeitung". The one responsible for the provocation was the pastor of the local parish community, Bernhard Preiss. A few months earlier, Preiss had carried out a similar event, then, there were protests by Catholics. Now Kapellari is pulling the emergency brake. Kapellari said to the newspaper: "It was simply an isolated event against the ecclesiastical order which will not take place." The Graz bishop stressed that a priest could not arbitrarily grant simply that divorced and remarried may go to Communion: "That neither the Pope, even I as a bishop, can not do this either. We even take care of remarried and homosexuals in personal conversations in counseling," said the Bishop of Graz. But Preiss would like to further provoke and shared in his parish bulletin with that he especially respects the will of the bishop. There will however be considered "a continuation in another form." To the "Kleine Zeitung" Preiss explains then: "I do not want to simply delete the Mass, we will not totally ignore the ban of the bishop, but we will also not entirely follow it either. Now creativity is called for." Edit: gasp, he put too much emphasis on the Blessed Virgin Mary! [Neudau] Conservative minister was recalled after crash with parts of his parish at his own request. In a letter to the people, Kapellari hopes for a new beginning, Sterninger will not return to the Eastern Styria after a break. Six weeks after taking over as pastor, Conrad Sternfeininger of Neudau, Burgau and Woerth's term is already over. Between the prevailing stresses as a conservative clergyman and much of the parish there had been a lot of tension. Now Bishop Egon Kapellari has responded and the priest - on its own request, as it is being described - is dismissed. In a letter to the parish Kapellari hopes for a new beginning, Sterninger will not return to the Eastern Styria after his break. The recent Neudauer Sunday Mass was held Auxiliary Bishop Franz Lackner. In a letter to the parish councils to Kapellari had turned, it was followed by a crisis summit on site. The church then declared reason was a top priority, Dean Josef Reichshoffer speaks of a "diocesan intervention". Sterninger himself wanted to give an opinion. The search for a successor, writes Kapellari, will not be known for a month. In the Diocese of Graz-Seckau every erroneous teaching is welcome. Actually, if a priest criticizes the moral and anti-Church homosexual ideology, the current hireling Bishop will become brutal and abusive. (kreuz.net, Sankt Veit am Vogau) The Old Liberal Bishop Egon Kapellari (76) of Graz-Seckau ridicules the Catholic Faith. At the same time he defends the immoral homosexual ideology as if it were a Dogma of the Church. Recently, he threatened the pastor of Sankt Veit am Vogau, Fr. Karl Tropper (75) with "ecclesiastical consequences". This happened according to reports from Ex-Reichsender [Nazi Radio in Vienna] Vienna (ORF) to Austrian journalistoids. Fr. Tropper had maintained in an article in the parish newspaper that the homosexual disorder is an "error in drive". He referred those stricken to the healing of their sexual neuroses. Last week [16 April] , the Diocese of Graz struck very officially in a press release against the clergyman. On April 18th, Msgr Kaleppari addressed the situation personally. Brittle Bishop: "Pastor suffers from the rigidity of old age"
The brittle Bishop was right abusive. So he portrayed the Bishop publicly as having "rigidity of old age". If Fr. Tropper cites the moral teachings of the Church once more or cites the Bible, he will be dealt with according to "Church law". At the same time Msgr Kapellari explained that it is the purpose of the Bishops' Conference, to conduct a dialog with the anti-Church media and the one man show "Pfarrer Initiative". "The teaching of the Church has always been against homosexuality. Homosexuality is a perversion according to the Bible." The clergyman declares the right "to be able to say what is in the Bible." The first thing the faithful will see in the magnificent baroque church is not the altar painting, rather the doormat with two gaping holes. 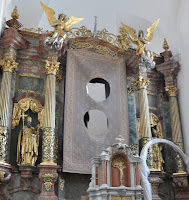 (kreuz.net, Vienna) Since December 1999, Pastor Hermann Glettler has been destroying the parish church of St. Andre in Graz in southwest Austria. The diocese of Graz-Sekau is currently being led to the wall by Bishop Egon Kapellari. Fr. Glettlers church originates from the 17th century. It was built by the Dominicans and consecrated in 1635. The interior of the church looks as though kindergarten had run wild within it. In front of the baroque high altar there is an example of a supper tale, which is made from mirror shards. Next to it there is a wire stand with a glass plate. The thing is used as a podium. On the church windows there are bright areas, which have distorted letters or -- more pointedly -- wolves in human clothes. 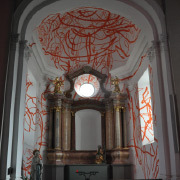 The white wall of the side chapel is smeared above with orange scribbling. Fr. Glettler was emboldened on his website with the idea, that he would consider to challenge "new artworks" . They put the old state of the church in "a new light". In any event the clergyman says that there's been an "aesthetic breakdown" with his art. In 2010 the facade was newly renovated. In the course of its new formation, a Graz painter wrote various slogans on the exterior wall. In various scripts, colors and sizes one can read profound things like "It greens so green", "tobacco", "nasty surprise", "Mozart", "sun flower", "sheep herd", "scale" , "park", "locksmith" or "lady slipper". During this Lent, Pastor Glettler hung a self-cut lenten cloth over the high altar. It is an old carpet in which Pastor Glettler has cut two holes. It gives a clear view of the round window behind the high altar. The chopped carpet should " challenge the expectation that an altar painting will be ordered" -- it says in an explanation. What Distinguishes You From Helmut Schüller, Lord Bishop? Humbug: "There is no right to any kind of "disobedience", but if one believes that the Church doesn't want blind obedience, there is but an act with solidarity in the midst of wide fields of pastoral possibilities." (kreuz.net) "I refuse to use the polemical word "disobedience" when it comes to discussing the Pastors' Initiative." Bishop Egon Kapellari of Graz said this on the 7th of September for the Austrian anti-Church news 'Standard'. Msgr Kapellari appealed that the whole Church should be viewed thus: "The global Church is anything but at rest." He bent the ear of the anti-Church magazine: "We would be pleased-- especially when it comes to the media -- 'if the successes received more attention." Because: "A Church, that is presented as weaker than She is, can not help society any better." Church schools, kindergartens and hospitals are more sought after than ever before. But: "The Song of Songs of displeasure is sung in the Church and society." There is enough cause for tears, but not so much reason to complain. "We accept the indissolubility of a sacramental marriage without a doubt" -- explained the Bishop. Yet at the same time he let loose the following antithesis: "One must proceed with sympathy and sensitivity with the various biographies of remarried divorced." One may not simply reject someone at the "communion rail", but rather should talk to them individually, in order to heal their wounds. "But if you know that there are remarried divorced in your diocese receiving Communion, as Bishop, you have to intervene, no?" Msgr. Kapellari coiled himself up: He has had many discussions with those affected by separation and always seeks them out, to help them, "with boundaries for life and otherwise to learn that they are not strangers in their Church." Here the Episcopal chat hit a wall: "What do you make of Helmet Schüller. Are you also "disobedient", if you don't undertake this?" -- asked the newspaper. Again, Msgr Kapellari turned a pirouette: "There is no right to any kind of "disobedience", but if one believes that the Church doesn't want blind obedience, there is an act with solidarity in the midst of wide fields of pastoral possibilities." The 'Standard' offered in return that the Faith then gets undermined by "substantial leeway". "In every society there are weighty norms, which one may not allow to be undermined. There are, however, also tensions which are very humanly understandable when it comes to translating this to those affected by the horizon of praxis." "I won't let myself be locked down"
"I won't generally say for sure, if anyone has been led to be counterproductive, that one should, as it is said, be thrown out of the community. He repeated himself: "I won't let myself be locked down, as to how far Pastor Schüller may go." He would like "to keep everyone in the boat". He would like to invite, "that no one should be boring into the hull of the ship, but pay more attention to the wind in the sails." The 'Standard" tried to play up the Mini-Pastors' Initiative: "Umpteen priests have signed the Call already." Msgr Kapellari countered: "The Call only consists of a Board of Directors." And took it back in the same moment: "But I wouldn't say it was not small." 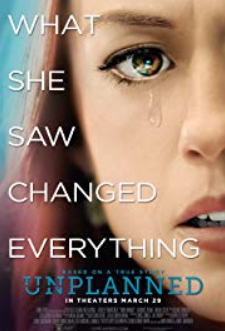 For still: "But I would like to put it all in perspective, but not with Tricks." Graz Priest, "By 2050 Austria Will be Muslim"
Karl Tropper directed a sharp criticism against Islam: "The Koran is the purest inflammatory pamphlet. By 2050 all of Austria will be Muslim. Graz Bishop Kapellari is not amused: Uncultivated style. Karl Tropper, the Pastor of St. Veit am Vorgau in the Diocese of Graz-Seckau has made severe criticisms of Islam according to Media Reports. In his most recent pastoral letter as per a "Kleine" news, he said that a Swiss Author had omitted that Muslims can not be buried with non-believers. The pastoral letter reads: "it's not only pure racism, this is also a backward step to Hitler and Stalin -- they have resolved to extinguish and extinguished, easily, millions of 'lives unworthy of life'." In another article he is asked by an author if Islam makes you sick and if "Islam" twists "the psyche of people into the completely absurd." His answer to the author: "You have to suspect it". Pastor Tropper stated his critical positions against Islam and spoke per "KLeine" word for word, of "pure racism" or "the Koran is the purest inflammatory pamphlet.. Muslims can't be integrated... Islam is intrinsically aggressive.. In 2050 Austria will be completely Islamic..." And: "Islam is the most repugnant." Tropper says Mosques can never be a house of God, because they produce nothing but war. There is irritation at the Graz Chancery over the words of Pastor Tropper. Bishop Kapellari said to the "Kleinen" - Times: "Those who are in positions of responsibility in the Church do not bring a solution to these problems when they make horrible oversimplifications and offer such an uncultivated style. This touches also on the theme of Islam, which the Church will meet neither with naivete and certainly not with raw aggression either." Pastor Tropper himself shows himself unmoved by the Bishop's displeasure: "At first the Bishop grouched at me again, but from the evidence I can see he remains guilty. I have to follow my conscience." according to the "Kleine" newspaper that those who leaves the Church, will count themselves in the company of Hitler, Stalin and other criminals. He received a reprimand then in 2010. Kapellari: Liturgy is, "Not Modelling Wax for the Individual"
Graz Bishop: 'Newly intensive efforts for the spirit and the form of Liturgy' necessary - Liturgy is not to be given over to the creative desire of individuals. Brixen (kath.net/KAP) Does the Mass have a future? "Naturally", explained the Graz Diocesan Bishop Egon Kapellari on his Sunday Sermon in the Cathedral of Brixen on the close of the "International Brixen Symposium 2010", "because the Church has a future and because the Church and the Mass belong inseparably together. In any case there will be starting today "newly intensive efforts about the spirit and the form of the Liturgy." Thusly, the religion may not be given over to the creative desire of individuals as a matter of fact: "Liturgy is not modeling wax at the disposal of individuals", said Kapellari. Actually, however, the joys and sorrows of as many Catholics as possible should be explained and considered, said the Bishop, in view of the lowering numbers of the participants in Sunday Services. He firmly believes in the promise of Jesus, that the powers of evil in the Church "while, powerful and damaging can never destroy it completely", said the Bishop. This of course does not say if the Church tomorrow will exist as a great majority or a small minority. For centuries cut off from the outside world, the persecuted Christians of Japan, who had absolutely no priests any more to celebrate the Eucharist, had "lived on as a holy remnant". "In general, however, it is valid that overall, wherever Catholics were a lasting presence, the Eucharist is always celebrated and will be celebrated in the future, even if in the course of history there are ever new challenges", said Kapellari. For young people, who know little of the nature of Liturgy, the threshold of the Mass must not be too flat: "But it can and should become for them and for other people, for whom Mass has become strange, church services that is to say are in the courtyard of the Mass", said Kapellari. There is place for a freer form of Liturgy, "which are not even Eucharists"
In "waiting", til the Liturgy is discovered again by many, the Church must be present in the secular community through social engagement and "intelligent" discourse in "concert of public opinion"; equipped for the "long haul", "through the prayer of those, who participate for all in the heart of the Church in celebrating the Eucharist. Using this means there must be a new Catechesis of Liturgy, which builds Christians "slowly but sustainably". From these means "a new ars celebrandi must be developed --even in conversation with culture and even with art of all kinds, after which so many year for," said the Bishop. The Brixner Symposium made an exemplary contribution to just such a conversation. "Smaller, but purer and nobler"
At the closing Kappelari continued in his preaching "on the life of the Church as a whole": "Our Catholic Church is at the present moment, must go through fire and water, which at this time in Europe is in the grip of some crises, so to say - so may we hope - will proceed even if indeed smaller, but purer and nobler," said the Bishop. "Christ will not leave his Church." This promise is never the less "no charter for sadness and a lack of imagination" or for "superficially permanent state of activity", rather a "seeking for a weatherproof, joyful and missionary Faith, which even under the current conditions is possible and in many cases a reality." The "International Brixner Symposium 2010" has taken place from the 8th to 10th of October under the title "The Mass - Source of Life, Highpoint of Faith?" The lecture at the Cusanus Academy combines Science, Culture and Spirituality. Copyright 2010 Katholische Presseagentur, Wien, Österreich. Alle Rechte vorbehalten.